58065-RB is rated 3.2 out of 5 by 62. Rated 3 out of 5 by Toothpick49 from Nice looking Like many other reviews, hard to attack handheld shower to the wall mount. Does not seem to stay put. Seems like it could have been made much better. Wish I had bought the magnetic hand held instead. Pressure is good from shower head but is reduced when using water from both handheld and wall mount. Rated 5 out of 5 by Patticakes from Delta shower faucet 58065 We are very pleased with this faucet. It's easy to change between the multiple settings as well as connecting or disconnecting the sprayer. I would definitely recommend it. Rated 5 out of 5 by WDWDUO from Great unit. This unit installs simply, nearly without tools. Flow pattern is fine. Rated 4 out of 5 by Bob from Like the shower head but the hand shower falls out of bracket We have used this shower head for a couple of years and like the overall performance. However, the hand shower has a tendency to fall out of the bracket into the bathtub. What can we due to prevent this problem? Rated 5 out of 5 by TTRR from Very Nice Easy to install. Having both types of shower combined into one is a handy design. No issues to report. The way the water falls is very relaxing and comfortable. Rated 2 out of 5 by JacH from Leaks I had this installed by my plumber and it has leaked almost from the beginning. It seams to leak very badly when you rotate the entire head in any direction. Design is nice but I can't get the leaks to stop. Rated 1 out of 5 by Joyce from Worst shower head ever no water pressure--just a trickle of water. I have taken it off and reinstalled it, but still no water. I will be throwing it away as soon as buy a replacement. Will definitely not buy Delta again. I recently purchased this product for a tub/shower but am having trouble finding escutcheon, handle, spout, etc. Thank you for your question. 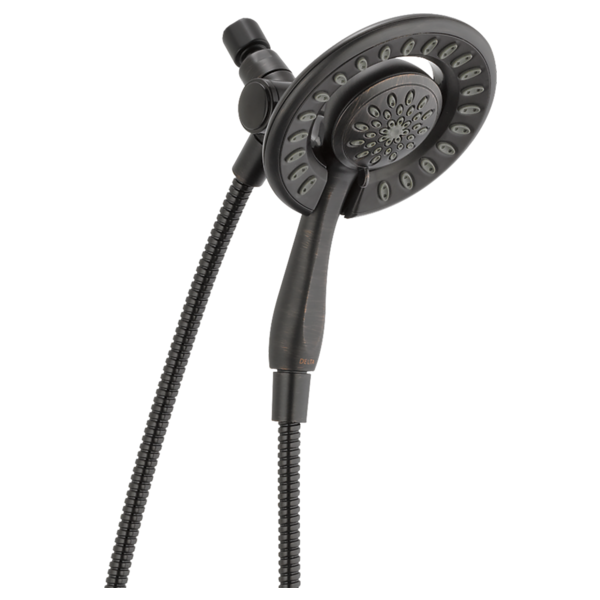 Delta Faucet model # 58065-RB is In2ition showerhead and hose only. It does not include a valve or handle or spout. It can be paired with any series in the Venetian Bronze finish. 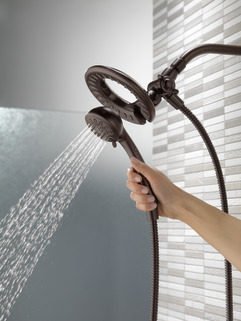 Switching between main showerhead and handshower. 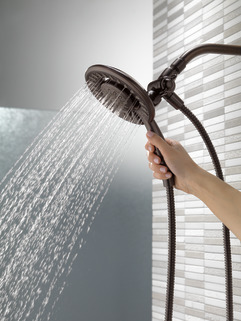 I can not reach up easily to the shower head, but I would like a combination of showerhead and hand shower. 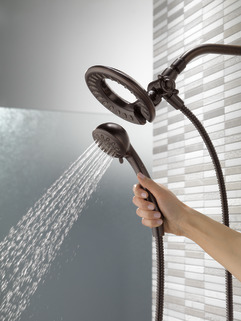 Is there a way that I can switch between the two showers from the handshower unit? Would the In2ition Series be able to do this if I kept the handshower unit down near the floor and not mounted to the main showerhead? Hi Laddie, Unfortunately no, you wouldn't be able to control the head unit with the hand unit. 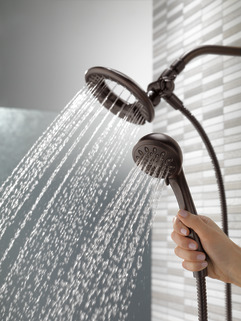 The controls on the hand unit can only control the hand unit, since most all shower units are analog systems (physically manipulated to divert the water). To do what I think you want would require two water lines run, one to the upper unit to control on/off and one to a lower unit controlling that on/off. 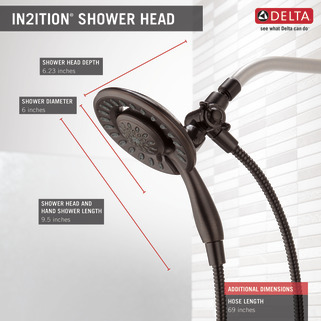 Otherwise, if you are comfortable with the upper head always on and you to be able to control the output of only the hand shower, the In2ition system is excellent! Wondering how the feature that is mentioned re: cleaning the holes of the shower head works. Do I just wipe the shower holes occasionally? How does the handheld connect to the stationary head? Some of the other lines of products say they connect via magnet. How does this one? 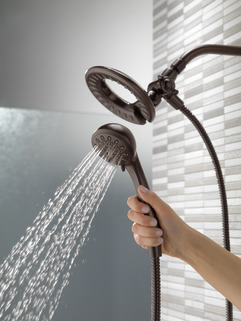 Just purchased In2ition shower head with hand held shower. Installation easy, went well. When turning it on water pressure through the shower head is great but when turned to use hand held pressure is greatly diminished. What can I do? What size allen wrench do you need to tighten the shower handle where you turn the water on and off? How does the &quot;pause&quot; feature work? This thing supposedly has a &quot;pause&quot; feature to use to slow water to a trickle as you soap up. 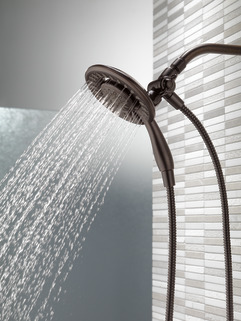 Where on the showerhead is this located? There is nothing in the directions it came with and I can't locate this feature on the showerhead.